What is the shape our climate-challenged world is in? Rich developed countries have made it clear they are not interested in any talk about their past emissions. 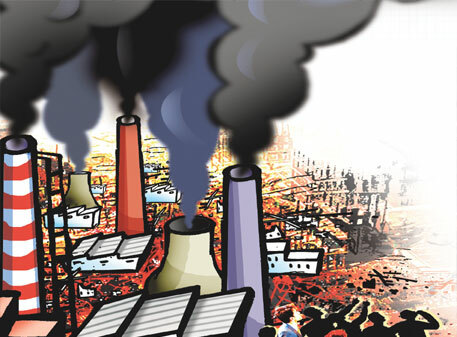 They point to emissions emerging economies such as India and China will spew in the future. That, they say, is the real problem. That’s the real mess. The rich countries also want their economies to be left alone. They want the onus of mitigation to pass on to the developing world. Thus, over the last two years, India, along with Brazil, South Africa and China, has come under severe pressure from developed country governments as well as the intelligentsia to commit to emission reduction, even when there is no financial support or technology transfer. On January 30 this year, India committed to reduce the emissions intensity of its gross domestic product (gdp) to 20-25 per cent below the 2005 level by 2020. Such mitigation will not apply to the agriculture sector. In other words, for every unit of gdp recorded, Indian economy will target to spew 25 per cent less of greenhouse gases (ghg). The declaration has triggered a flurry, with international development and technology consultants priming for a kill: hardsell low carbon growth in India. The country, too, is honing its low carbon growth strategies. 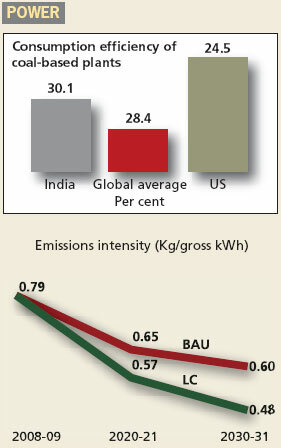 In 2009, the Centre for Science and Environment’s Green Rating Project decided to study the most energy- and emissions-intensive sectors of Indian industry. Five sectors fitted the bill: paper and pulp, cement, aluminium, steel and fertilizer (urea). So did the power sector, responsible for a lion’s share of the country’s greenhouse gas emissions. In 2008-09, these six sectors accounted for an estimated 61.5 per cent of total greenhouse gas (ghg) emissions in India, excluding emissions from agriculture and waste. Their energy profile is no less intensive. But there are other reasons for the focus on just these sectors. Today there exists a reactionary consensus in climate change chatter that India’s rising ghg emissions are in no small part due to the fact that industry here is inefficient. Is that true? How exactly do the country’s most energy- and emissions-intensive sectors fare in this respect? One honest reply is there is a dearth of data on energy consumption and greenhouse gas emission trends in the sectors that comprise industry in India. Another is there’s such a glut of analyses on low carbon growth in India—wider-angle, macroeconomic, regional-global, non-Annex I, polemical-ethical—and on how India, like other developing countries, can and should achieve it; it’s a shame India has not already achieved it. The study uses data sourced from industry itself and then verifies it. Such data allows for a realistic picture. Using this data, the study shows how the sectors perform. But it does more. At one level, it identifies technology options these sectors could go for to reduce their energy and emissions intensities. At another, it projects the trajectory these sectors will take up to 2030-31, under two scenarios—a business as usual (bau) scenario and a low carbon (lc) scenario (see: Glossary,). Since liberalization, the Indian eco-nomy has grown at 6.8 per cent. Obviously, India’s commercial energy consumption (see: Glossary,) has been growing at a consistent rate. In 2007-08, out of India’s total primary energy supply of 23.9 Exa Joule (EJ, or 10 18 Joules), only 26.2 per cent was non commercial and consisted of mainly biomass, used by poor people, mostly women, outside the net of the market, to cook food. The rest of energy, commercial energy, was highly dominated by coal, lignite, oil, natural and liquefied natural gas. 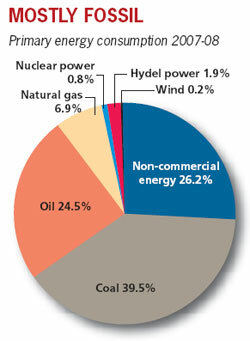 Nuclear, hydel and wind contributed only 2.9 per cent of total primary energy (see: Mostly fossil). From 2004-05 to 2006-07, commercial energy consumption increased annually by 5 per cent. The commercial energy consumption was an estimated 15.6 EJ in 2008-09. How much of this commercial energy does industry, as a whole, consume? In 2006-07, industry consumed 7.3 EJ of commercial energy, including non-energy use of natural gas and petroleum products. This has grown annually at 6.3 per cent between 2004-05 and 2006-07. Commercial energy consumption in industry was an estimated 7.8 EJ in 2008-09. Indian industry, therefore, consumed about 50 per cent of India’s total commercial energy and contributed 18.5 per cent of India’s gdp in 2008-09. This means in 2008-09 the energy intensity of industry, defined as energy consumed per Rs crore of gdp, was 4.4 times that of the rest of the economy, that is agriculture and services combined. Within industry as a whole the sectors selected are the most energy-intensive. In 2008-09, five sectors—steel, cement, urea, aluminium and pulp and paper—consumed about 3.34 EJ energy, thus cornering about 43 per cent of all the commercial energy industry as a whole consumed that year. The power sector is the most emissions-intensive. India’s power sector is coal-dominated. Of the 2007-08 gross power generation of 722.63 Terawatt-hour (TWh, 109 watt-hour), 67.8 per cent was generated by coal-fired units and 9.6 per cent by gas-fired units. In totality, 77.4 per cent of total power generated was from fossil fuels. This is why the power sector is the single largest contributor of ghg emissions in India. The question is how these sectors in poor India fare in terms of emissions and energy efficiency. In general, our benchmarking of the specific energy consumption and ghg emissions for the six sectors indicates a mixed performance. Some sectors already perform at the global best level, some possess huge potential to improve and, in some, the potential to improve cannot be realized because of the unique characteristics they possess. In terms of prospects, the study shows that in both scenarios, business as usual and low carbon, the sectors’ performance will peak by 2020. Thereafter, the emissions reduction options stagnate. This is the real, even nasty, surprise. Or should we term it a wake-up call? Consider, for instance, the question of emissions intensity of gdp, as of now the stated core of India’s approach to mitigation. We find even in business as usual, the emissions intensity from these six sectors will reduce by about 20 per cent below 2008-09 levels by 2020. 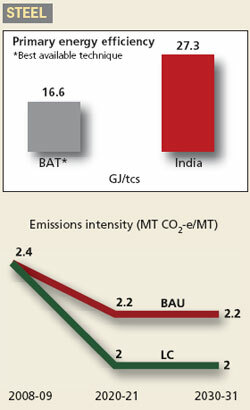 With respect to the 2005 level, the base year the Indian government used when announcing its mitigation plan, emissions intensity will reduce even more. Moreover, in an ambitious low carbon scenario, emissions intensity can reduce by 30 per cent below 2008-09 levels by 2020. But after 2020, this study shows, emissions intensity in many of these sectors reduces only marginally or even stagnates in both business as usual and low carbon scenarios, even after deploying all available technologies. A nasty surprise: a real wake-up call. This sector has a very high energy-saving potential vis-a-vis best available techniques. However, there is limitation to realise this saving potential because of the process route chosen to make steel and because the plants use coking and non-coking coal with high-ash content and iron ore with high silica and alumina content. Steel production in India today is dominated by the Blast Furnace-Basic Oxygen Furnace (BF-BOF) route. In the future, production will shift decisively towards Direct Reduced Iron-Electric Furnace (DRI-EF) process route. The problem is DRI-EF is less efficient than BF-BOF and their emissions-saving potential is also not as high as that of BF-BOF. Secondly, the emissions-saving potential of a DRI-EF plant can be easily implemented by 2020-21 in BAU. 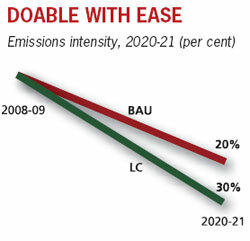 The result is the emissions intensity reduces by about 8 per cent in BAU and 17 per cent in LC between 2008-09 and 2020-21. After 2020-21, emissions intensity stagnates. For this sector, the future after 2020 is a cul-de-sac. What should be done? Should steel companies begin to opt for BF-BOF from today itself? Who will import the coking coal this more efficient process route requires. India has no reserves of this raw material? The Indian cement industry is probably the most energy-efficient in the world today. While the market share of blended cement (which is less energy and emission intensive than ordinary portland cement) is high in India, the percentage of blending material in cement is still lower than what is possible. This sector can further lower its emissions intensity by increasing the proportion of blended cement in its total production. Further, the percentage of blending material in cement needs to increase. In this context, this sector faces regulatory constraints. Current regulations allow only one type of blending material (flyash or slag) and the percentage blending is fixed. This need to be sorted out. The sector can also recover waste heat from the clinker cooler and convert it into electricity. But installing waste heat recovery boilers is currently very expensive. In this sector, emissions intensity under the business as usual scenario reduces by about 25 per cent between 2008-09 and 2030-31. In low carbon growth, the emissions intensity can be reduced by 35 per cent. The performance of aluminium smelters based on the pre-baked technology, accounting for about 80 per cent of production, is among the best in the world in terms of electricity consumption and perfluorocarbon emissions. But fuel consumed in the refinery for alumina production is high. Companies rely on inefficient coal-fired captive power plants, resulting in high emission intensity. Low carbon growth will require converting remaining capacity of Soderberg smelters to pre-baked anode systems, which is expected to take place even in BAU. To reduce fuel consumption for alumina production, the industry will have to adopt energy-efficient technology. However, sourcing a high proportion of electricity from renewables and switching to high-efficiency captive power generation will provide the lion’s share of emission reduction. Emissions intensity under BAU reduces by about 17 per cent between 2008-09 and 2020-21. It stagnates after 2020-21. In the LC scenario, there’s about 40 per cent reduction in emissions intensity between 2008-09 and 2020-21 (but this will need 30 per cent of the total energy to come from renewables). Beyond this, emissions intensity stagnates. 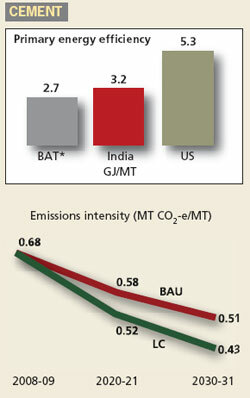 The Indian paper industry performs poorly with respect to energy consumption and greenhouse gas emissions. The study indicates an energy-saving potential of nearly 70 per cent. This sector is a very good example of the fact that there can exist limits to mitigation. The sector will always lag behind global best performance in energy and emissions intensities. This is because of its inability to profitably scale down best practices. Indian mills are small and are likely to remain so in the future. Inconsistency in the nature and quality of raw materials, and the fact that Indian mills are multi-product in nature, pose further limitations. The source of raw material for paper production will decisively shift towards wastepaper and market pulp in the future, reducing the overall emissions intensity. The sector can reduce its emissions intensity by increasing the share of internally generated biomass energy. For this, the black liquor solids must be efficiently used through multi-effect evaporators or gasification systems. Continuous cooking systems will have to be adopted. Electricity consumed may be reduced by adopting efficient, large paper machines and installing variable speed motors, pumps and drives. About 78 per cent of India’s urea production is from the efficient natural gas feedstock. The performance of gas-based plants is very good when compared to both global averages and the best practice. Fuel oil- and naphtha-based plants also show relatively good performance. Low carbon growth in this sector will require converting all existing plants, and additional production stocks, to natural gas as feedstock. The industry can reduce its total emissions in 2020-21 over 2008-09 levels just by conversion to natural gas. Therefore the most critical issue the sector’s future faces is this: will natural gas be available so that such conversion is possible? The government has set an ambitious target of lowering the energy consumption in Indian urea plants by nearly 11 per cent below the global best practices through research into high pressure reformers and shift catalysts, membrane based CO2 removal systems, low pressure catalysts for synthesis and solid oxide fuel cells for captive power generation. If these plans bear fruit, this sector can further improve its emission profile. How big an ‘if’ is that? Coal-fired power generation in India is more efficient than the global average—30.1 per cent net efficiency compared to 28.4 per cent globally. Of course, efficiency is lower than what’s achievable using advanced steam parameters and better grid- and load-management practices. The low quality of Indian coal results in specific emission from coal-fired plants in India of 1.1 kg/kWh; this is about equal to the global average. The efficiency of gas-fired power generation in India, 41.9 per cent, is also about equal to global average. In all this, the crucial issue to note is power generation in India will remain highly dependent on coal till 2030-31, in both BAU and LC scenarios (70 per cent and 57 per cent respectively). In LC, 100,000 MW solar energy, 50,000 MW offshore wind, 40,000 MW onshore wind, 50,000 MW biomass energy have been assumed. The sector has typical limitations: climatic conditions of operation, such as high temperature and humidity, and lower coal quality, will always impede Indian plant performance. Even supercritical and ultra-supercritical coal-fired thermal power plants in India are not likely to provide the same level of efficiency as in western countries because of these limitations. Most growth projections of Indian economy predict that India will grow at 8 per cent annually in next two decades. Accordingly, the six sectors will grow distinctly but in robust way. Steel production will increase from 58 million metric tonnes (mMT) in 2008-09 to about 302 mMT in 2030-31. The per capita steel production in 2030-31 will be about 210 kg lower than the 2008 per capita steel consumption in China and the US (321 kg and 373 kg). Cement production will grow five-fold to 922 mMT in 2030-31. The per capita cement production in 2030-31 will be about 630 kg, about the same as the 2003 per capita cement consumption in China. Aluminium production will increase from 1.34 mMT in 2008-09 to about 6.4 mMT in 2030-31. The per capita aluminium production in 2030-31 will be about 5 kg, about one-third the current per capita aluminium consumption in Japan. Paper production will grow from 7.6 mMT in 2008-09 to 28.5 mMT in 2030-31. The per capita paper production in 2030-31 will be about 20 kg. This will be one-fifteenth of the current per capita paper consumption in the US. Urea production will grow at a much lower rate and will be 36.5 mMT in 2030-31. The gross power generation will increase from 723 Terawatt-hours (TWh) in 2007-08 to 3,225 TWh in 2030-31. Per capita gross power generation will increase from about 650 kilowatt-hours (kWh) in 2007-08 to about 2,250 kWh in 2030-31. Even so, in 2030-31 per capita gross power generation in India will be just about one-seventh of the current gross power generation in the US. The total ghg emissions from the six sectors will be 3.6 times more than today, growing from 897 million MT (mMT) in 2008-09 to 3,255 mMT in 2030-31. The per capita emissions from these sectors will increase from 0.8 MT in 2008-09 to 2.2 MT in 2030-31. In 2008, of total ghg emissions from the six sectors, 63.5 per cent was from the power sector. The other five sectors accounted for the remaining 36.5 per cent. In 2030-31, however, the five sectors will contribute 40.6 per cent. This essentially shows emissions from the five sectors will grow at a higher rate than that in the power sector. Growth in emissions will be highest for the iron and steel sector. The total ghg emissions will triple, from 897 million MT (mMT) in 2008-09 to 2,668 mMT in 2030-31.
ghg emissions will grow annually at 4.9 per cent between 2008-09 and 2020-21 and then increase to 5.3 per cent from 2020-21 to 2030-31. The per capita emissions will increase from 0.8 MT in 2008-09 to 1.8 MT in 2030-31. In this scenario too, ghg emissions from the five sectors will grow at a much faster rate than in the power sector. In lc, the contribution of the power sector to total ghg emissions will be 57.4 per cent, marginally down from the 2030-31 bau value of 59.4 per cent. In lc, too, the highest growth in emissions will be from the iron and steel. 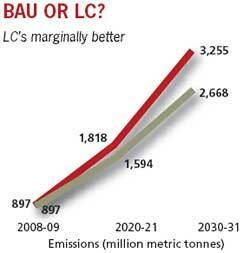 Annual mitigation potential of lc over bau is about 18 per cent in 2030-31—587 million MT CO2e/ annum. This will largely happen because of massively deployed renewable energy technology in the power sector. 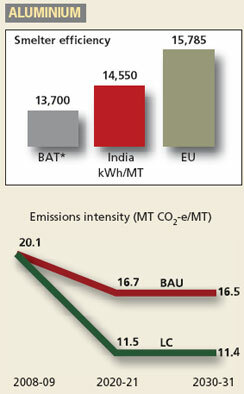 Cumulative emissions savings, lc over bau, 2008-09 and 2030-31, are about 5,200 mMT CO2e. The highest cumulative ghg emission savings is from the power sector (3,400 mMT), due to the push for renewables. 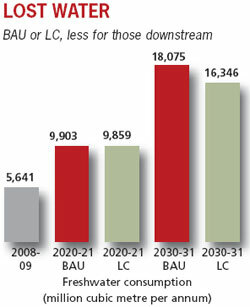 Resources requirement for projected production levels, bau and lc, will be many times the current. In bau, coal requirement for the six sectors will almost quadruple, to about 1.9 billion metric tonnes (MT), by 2030-31. This will be a formidable challenge, with vast environmental and social consequences. According to the Integrated Energy Policy (iep), domestic production of coal in 2030 is projected to be about 1.5 billion MT. This means in bau India will have to import about 500 million MT of coal to meet the requirements of just the six sectors. Even in lc, coal requirement will be about 1.5 billion MT in 2030-31—thrice the current level of production and about the same as iep has projected. India currently mines far more iron ore than domestic industry requires to produce iron and steel. In 2008-09, an estimated 220 million MT of iron ore got mined, of which 60 per cent of iron ore was exported. The study did not account for exports. Iron ore requirement will increase from about 75 million MT in 2008-09 to 400 million MT in 2030-31—double the iron ore currently mined. There is no difference between iron ore required in the bau and lc scenarios. This is largely because of the low contribution of scrap to steel production in the country in both scenarios. Bauxite required to make aluminium will increase almost five-fold, reaching 35.4 million MT by 2030-31. There is no difference in bauxite requirement in BAU and LC. A projected five-fold increase in cement production by 2030-31 means limestone requirement increases four-fold in BAU. In 2030-31, limestone this sector requires will reach 825 million MT. In the LC scenario, however, limestone requirement will be only about 700 million MT. The difference is largely because LC assumes increased use of blending material and a larger proportion of blended cement production. Projected increase in production in the six sectors will put a severe strain on India’s freshwater resources. In 2008-09, the six sectors together withdrew about 41,538 million cubic metres (cu m) of freshwater, equivalent to freshwater demand of 1.1 billion people on a daily basis. These industries consumed (lost from the water cycle) 5,641 million cu m freshwater, an amount required for drinking and cooking of more than a billion people on a daily basis. Industries discharged 35,897 million cu m wastewater which in turn polluted more freshwater. Essentially, therefore, the six sectors together are already consuming water equivalent to the domestic water need of the country. The study shows while freshwater withdrawals will increase at a relatively lower rate, freshwater consumption will increase dramatically. In other words, those downstream will get less water to use. This will severly contest with domestic and agricultural water demand and will spark major conflicts—which has already started to happen in many parts of the country. Freshwater withdrawal in the six sectors will increase by 40 per cent by 2030 to 57,006 million cu m.
The reason for a lower rate of increase in freshwater withdrawal is the change in technology in the cooling system in thermal power plants. Presently, a large majority of thermal power plants have once-through cooling systems (large quantities of water is pumped to cool the plants and immediately discharged) and only 20 per cent have cooling towers (in which the same water is recirculated again and again to cool the plant). A thermal power plant with cooling tower withdraws 20-30 times less freshwater than one with once-through cooling system. But there is a flip side—cooling towers consume more water (loss through evaporation) than the once-through cooling system. Lately, once-through cooling systems have not been allowed for thermal power plants using freshwater and this trend will continue in the future. This change alone is the primary factor that reduces the rate of growth of freshwater withdrawal. But still, in 2030-31, the power sector will account for 87.4 per cent of total freshwater withdrawal, down from 95 per cent in 2008-09. The iron and steel sector will be the second largest user. The impact of the low carbon scenario over business as usual, so far as freshwater withdrawal is concerned, is minimal—freshwater withdrawal in lc is about 3 per cent lower than in bau. Freshwater consumption will more than triple in the next two decades and reach 18,075 million cu m in 2030-31. This will have social and environmental implications, for this water will be lost. The power sector will account for the major share of freshwater consumption. Its share will reduce from 90.5 in 2008-09 to 85.2 per cent in 2030-31. Water consumption will increase most dramatically in the iron and steel sector, in the cement sector and in the aluminium sector. These three sectors will see a six-fold increase in water consumption. 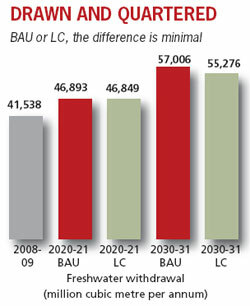 In lc, freshwater consumption in 2030-31 is about 10 per cent lower than in bau. This is largely because of reduction in power generation from coal-based power plants, assumed in the lc scenario. But so far as the other sectors are concerned, reductions are marginal. The study estimates land the six sectors occupy in 2008-09, including land leased out to mine coal, bauxite, limestone and iron ore, to be about 0.7 million hectares (ha). But this figure might be a gross underestimation because in past industries have acquired far more than what is required for the production facility. Golf courses and clubs are not uncommon in industry premises. About 56 per cent of land currently occupied is under mining. The 44 per cent remaining is plant area. 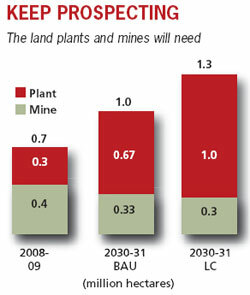 From now up to 2030-31, an estimated one million ha of additional land will be required for mines and to set up plants. The power sector will take up about 64 per cent of land. The steel sector will need 16 per cent and the cement sector 10 per cent. The paper, fertilizer (urea) and aluminum sectors will take up the remaining 10 per cent. The coal, bauxite, iron ore and limestone required will hog 0.33 million ha. This is similar in magnitude to land leased to mine these minerals since 1947. For example, 185,000 ha of additional land will have to be leased to mine coal, to meet demand by 2030-31. This is 50,000 ha more than all coal mine leases granted in the country so far. Land required to set up plants will be double that required for mining (0.67 million ha). By 2030-31, about 0.5 million ha of additional land will be required to set up power plants of all types. Iron and steel plants will need 70,000 ha, cement 30,000 ha, aluminium 29,000 ha, pulp and paper 20,000 ha and fertilizer (urea) 16,000 ha. There is a clear trade-off between land and a low-carbon economy. Our estimates show low carbon growth will require 30 per cent more land than in bau. Of the 1.3 million ha additional land required in the low carbon scenario till 2030-31, about 0.3 million ha will be for mining (0.33 million ha in bau). In lc, plants will require one million ha (0.67 million ha in bau). The major reason land required in lc increases so much is because of enhanced power production capacity from solar energy assumed in lc, as compared to bau. In lc, we assume solar power capacity will increase five-fold to 100,000 MW, as compared to 20,000 MW in bau. The total additional land required to support growth in these six sectors is 1-1.3 million ha. This figure might seem small, considering India has 328.7 million ha of land. But factor in acquisition and the violation that explodes in people’s lives, factor in diverting deposit-laden forest areas for non-forest use and the impact that has on watersheds, wildlife and people, factor in the way people fight to retain what they believe is their own, and you will know what it means for so much land to be given to industry.